What time is check-in? Check-out? Are you going to charge my credit card when I reserve a room, or wait until I check in? Deposit Policy: Each reservation requires a deposit equal to the first night's stay plus applicable fees and taxes. Packages which include tickets, etc. may require a deposit equal to the entire stay. The credit/debit card you provide will be charged immediately for the amount of the deposit. The credit/debit card used to make the reservation must be presented at check-in. Cancellation Policy: For reservations cancelled more than 72 hours prior to arrival date a $10.00 Cancellation Fee will apply. For reservations cancelled less than 72 hours prior to arrival date a Cancellation Fee equal to 50% of the first night's projected charges will apply. For reservations cancelled on the day of arrival a Cancellation Fee equal to 100% of the first night's projected charges will apply. AAA, CAA, AARP, Government, and Military discounts are available. Is there an extra charge for more than two adults? Is there a per person fee? Do children stay free? We do not charge per person. All of our guest rooms are priced according to their particualr size and bedding type. For example: if a room will sleep up to four guests, the price we charge is for up to four guests - more than four guests would require a larger or additional room(s). If, for whatever reason, your hotel is not what I expect - what then? With our 100% Satisfaction Guarantee, you can have complete confidence in your stay with our hotel. If your accommodations do not meet your expectations, please inform the Front Desk within 30 minutes of your check-in and we will make every effort to remedy the situation. Should we be unable to resolve the issue, we will find suitable lodging for you or cancel and refund your stay. What's included in my condo? Each stay includes an amenity starter pack and basic kitchen items. Is there a charge for Housekeeping? Limited housekeeping is included with your stay. Full Service is available for a nightly fee. All guest rooms are non-smoking. Our guests are welcome to smoke outside of the hotel. Are very small pets okay? We are a pet-free hotel. No pets of any size are permitted. Ramada on the Parkway does offer pet rooms. Do you have roll-away beds or cots available? No, we do not have roll-away beds or cots. We do not have cribs, but we do offer a 'Pack n Play' for a minimal fee. Yes, every guest room includes a microwave. Do you offer a Continental Breakfast? No, as each unit provides a full kitchen, Continental Breakfast is not served. Our indoor water park is open from 9am til 11pm everyday of the year! 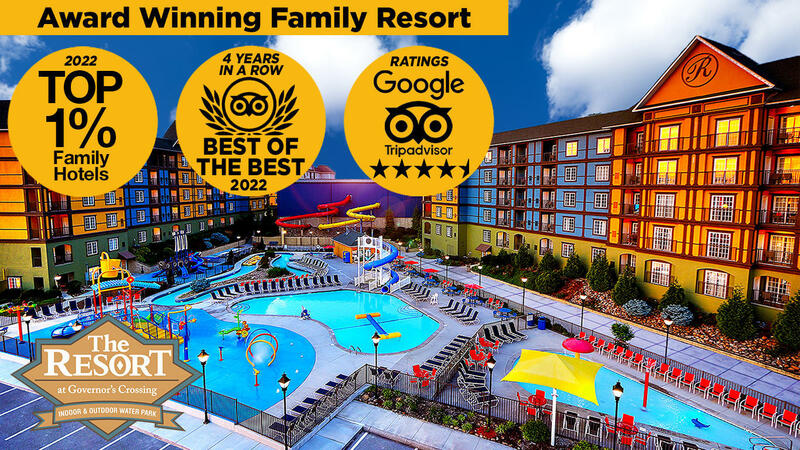 All of our guests enjoy full access to the water park at no additional charge. Kids love the water umbrella and other activities! Refresh and invigorate with the Jacuzzi, or relax in the Sauna! There is something for everyone! The outdoor water park at The Resort @ Governor's Crossing is open from 9am until 10pm, seasonally. Enjoy the warm weather and sun with the many activities available, at no extra cost. The Lumberjack Log Roll is a perennial favorite, and the kids love the water slide! Dollywood's main entrance is less than 5 minutes away! How much parking is available? Is there a fee? The Resort at Governor's Crossing has ample parking available. There is no parking fee. Do you have discount tickets for Dollywood, Ripley's Aquarium, etc? We offer Dollywood passes at our Front Desk. Is there a guest laundry area? No. All condos units (except the Queen Studio) include a washer and dryer. Are exercise facilities available at your hotel? Yes. All of our guests are welcome to use the on-site fitness center. Is there a Trolley stop nearby? There is a Pigeon Forge Trolley stop within walking distance of the hotel. Do you have balcony rooms? Some of our guest rooms do include a balcony and are designated as such.